Tracker is a cross platform application for tracking objects in videos, image stacks, or files that contain object positions (\*.csv, \*.mat). Any object that can be segmented from the background can be tracked. The original motivation for this code was to track particles in multiphase flow reactors such as fluid beds, spouted beds, moving beds, and risers so that particle velocities could be measured to use for validation. This technique is typically known as particle tracking velocimetry (PTV). 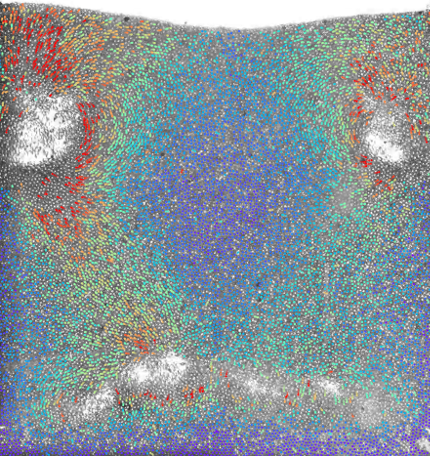 Particles colored by velocity in a fluid bed. This project is written in Python and relies heavily on the “standard” scientific stack including numpy, scipy, and matplotlib. For most of the media reading and image processing, OpenCV is used. Finally, the graphical user interface uses Qt.